Hmmm, it looks as though you might want to pump up the volume level in your apartment when you’re watching your favorite action movie, simply because you can’t afford to go to a cinema repeatedly to enjoy blockbusters, unless you’re filthy rich. Well, for those at home who can’t afford a home theater system and are looking for something even cheaper, there is still hope – just don’t let your friends and family know unless you don’t mind being sneered at. The Personal Television And Theater Amplifier supposedly amplifies sound from a TV, radio or theater by up to 50 decibels, coming in the form of a wireless rechargeable earpiece. It features a directional microphone that amplifies high- and low-frequency sounds to produce rich, easy-to-hear tones – hopefully this means you can hear your wife clearer whenever she nags you to get around the house chores. 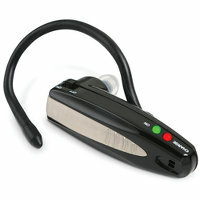 Its lithium-ion battery supposedly powers the earpiece operates for up to 18 hours after a four-hour charge. Hammacher is carrying the Personal Television And Theater Amplifier for $29.95.